These terms and conditions apply to all users (including but not limited to members), of mainmarketafrica.com. Additionally, these terms and conditions apply to the use of and (where applicable) purchase of mainmarketafrica.com products and services, including but not limited to membership subscriptions, events and the placing of advertising with mainmarketafrica.com. Please read these terms and conditions carefully, as they affect your legal rights. 1.1 Your agreement to comply with and be bound by these terms and conditions is deemed to occur upon your first use of this website. By using this website and agreeing to these terms and conditions, you represent and warrant that you are at least 18 years of age. You will not use this website for any purpose that is unlawful or prohibited by these terms and conditions. 1.2 Mainmarketafrica.com reserves the right to change these terms and conditions without notice, and users agree to be bound by such changes. It is the responsibility of users to check this Terms and Conditions regularly for any changes. By accessing/visiting mainmarketafrica.com or any of its associated linked sites, you have read, understood and agreed to be legally bound by the Acceptance Terms as contained herein in Section 1 to 15 (hereinafter referred to as ‘Agreement’). By registering, you certify that all information you provide, now or in the future, are accurate. Mainmarketafrica.com hereby grants you a limited, non-exclusive, non-assignable and non-transferable license to access mainmarketafrica.com provided and expressly conditioned upon your agreement that all such access and use shall be governed by all of the terms and conditions set forth in this Agreement. Mainmarketafrica.com as well as the design and information contained in this site is the valuable, exclusive Intellectual Property of MAINMARKETAFRICA.COM, and nothing in this Agreement shall be construed as transferring or assigning any such ownership rights to you or any other person or entity. Neither mainmarketafrica.com (including its owner and their directors, employees, affiliates, agents, representatives or subcontractors) shall be liable for any loss or liability resulting, directly or indirectly, from delays or interruptions due to electronic or mechanical equipment failures, telephone interconnect problems, defects, weather, strikes, walkouts, fire, acts of God, riots, armed conflicts, acts of war, or other causes beyond its control or like causes. Mainmarketafrica.com shall have no responsibility to provide you access to mainmarketafrica.com while interruption of mainmarketafrica.com due to any such cause shall continue. I] You expressly understand and agree that mainmarketafrica.com and its owners, suppliers, consultants, advertisers, affiliates, partners, employees, Service Providers (hereinafter referred to as ‘Associated Entities) have taken due care and caution in compilation of data for mainmarketafrica.com. The views and tips expressed by, if any, including but not limited to, experts, agencies, companies, linked sites on mainmarketafrica.com are their own, and not that of mainmarketafrica.com or its management. b) Make no warranty that the services, content, live update, deferred live update etc. offered by us will (i) meet your requirements or expectations, (ii) be uninterrupted, timely, secure, or error-free, (iii) be accurate or reliable. c) Any reliance upon or use of any services availed through links of affiliates shall be at your own discretion and risk. The services are provided or made available by us on an ‘as is’ basis and we expressly disclaim any and all warranties of merchantability and fitness for a particular purpose, with respect to any of the materials /services. 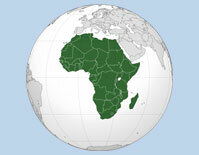 Mainmarketafrica.com may contain social networking, user generated content, message/bulletin boards, chat rooms, or other message or communication facilities (collectively, "Forums"), you agree to use the Forums only to send and receive messages and Services that are proper and related to the particular Forum. You shall provide and maintain all equipment necessary to access mainmarketafrica.com, and the costs of any such equipment and/or telephone/internet connections or use, including any applicable taxes, shall be borne solely by you. You shall indemnify, defend and hold harmless mainmarketafrica.com and its Associated Entities from any and all actions criminal or civil in nature, claims and losses imposed on, incurred by or asserted as a result of or related to: (a) your access and use of mainmarketafrica.com (b) any non-compliance by you with the terms and conditions hereof; or (c) any third party actions related to users receipt and use of the information, whether authorized or unauthorized (d) or any other reason, whatsoever. Mainmarketafrica.com reserves the right in its sole discretion to refuse service at any time. Provision of any services is subject to availability. This terms and conditions constitute the entire agreement between you and mainmarketafrica.com and superceeds any prior understandings and agreements between you and us and any previous statements or representations irrespective of whether such documents is prior to or subsequent to this Agreement, or is signed or acknowledged by any director, officer, employee, representative or agent of mainmarketafrica.com. This User Agreement and the license rights granted here shall remain in full force and effect unless terminated or cancelled immediately by mainmarketafrica.com at its sole discretion.